Johnamarie Macias, a bubbly 29-year-old Puerto Rico native who's grounded herself in New York City, is never seen without a smile that gleams as bright as the twin suns of Tatooine and has a sweet soul full of passion for Star Wars. "Star Wars, to me, is imagination at its best. One person dreamed up a galaxy, took us along for the ride and the ride just keeps on going. It’s an escape to a far-off place filled with unlimited possibilities where an ordinary person, whether they’re a farm boy or a scavenger, can change the galaxy," remarks Macias. Captain Rex from Star Wars: The Clone Wars captured Macias's heart. Introduced to Star Wars at a young age, Macias remembers Star Wars: A New Hope as a classic movie that she would watch whenever it was played on the television. Her mom and uncle were also fans of the franchise, which helped cultivate her interest in the Star Wars universe, but she didn't find a true passion for the saga until a little later in life. "It wasn’t until the prequel films and the debut of the Star Wars: The Clone Wars feature film in theaters that I found myself back in the galaxy far, far away," says Macias. She found herself attracted to Star Wars because it opened up her imagination as a child and continues to inspire her to dream up her own stories today. Macias notes that she was never great at verbally communicating her thoughts while growing up, but her involvement in the Star Wars podcasting community has helped her feel more comfortable in voicing her opinions out loud. Macias uses her website called The Wookiee Gunner as a platform to write about her favorite aspects of Star Wars. She's also involved in three different collaborative podcasts: Rebels Chat, Galactic Fashion, and Hangin' with Team Kanan. 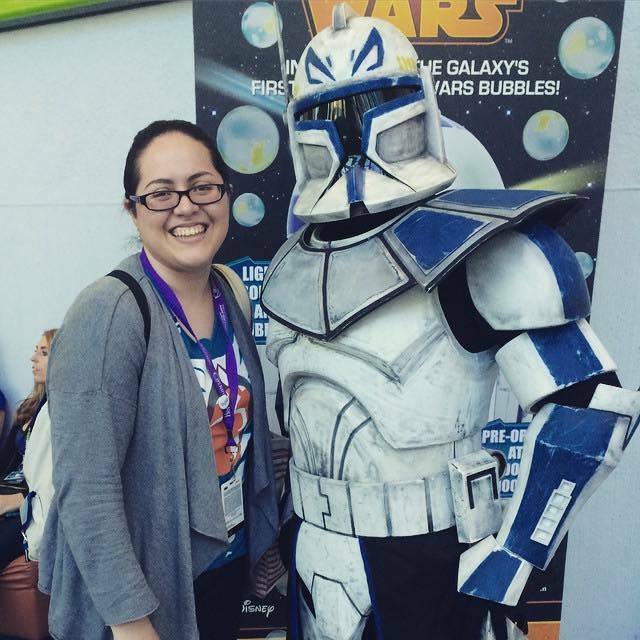 "Rebels Chat is very special to me because it’s where I talk Star Wars Rebels with my mom. She’s one of the coolest moms out there, and I’m glad we can come together once a week to talk about the Ghost crew and their adventures," explains Macias. Galactic Fashion is a Star Wars fashion podcast that Macias co-hosts with fellow fangirl Teresa Delgado. This creation came about when she started brainstorming about geek fashion and wanted to involve other women in the conversation about Star Wars style. Macias has interviewed several Star Wars fashion designers including Ashley Eckstein, Lisa Granshaw, and Catherine Elhoffer for episodes of Galactic Fashion. She also came together with fans Catrina Dennis and Jeremy Konrad to create their own Star Wars Rebels podcast, Hangin' with Team Kanan. "It’s always a treat working on these projects because I get the chance to collaborate with friends on similar interests and create original content," says Macias. Ezra Bridger, a young Force-sensitive boy from the planet of Lothal in Star Wars Rebels, has been an inspiration to Macias and her Star Wars fandom. She says sees herself in Bridger's character because "he has a good heart and good intentions." She cherishes his character so much that she decided to start a collection of Ezra Bridger merchandise. Macias currently owns over 30 different items including action figures, plush toys, jewelry, and T-shirts featuring her favorite Rebels character. 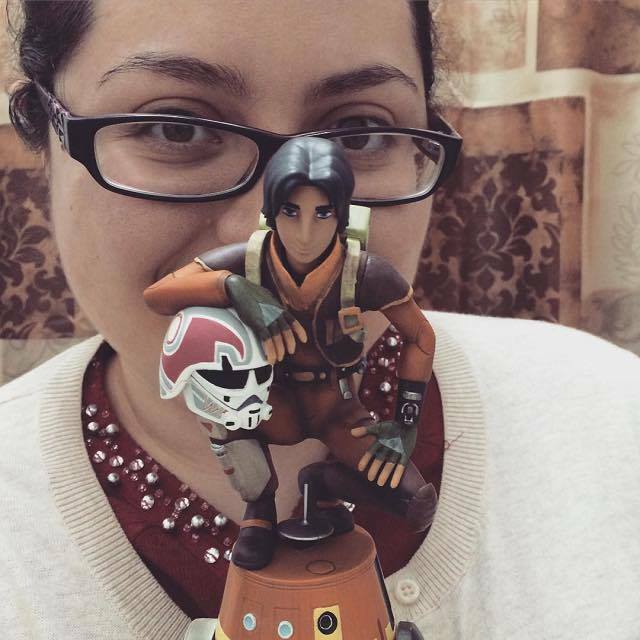 Johnamarie Macias with one of her Ezra Bridger collectables. One of her favorite pastimes is making custom tooka dolls. These soft, brightly-colored plush dolls were first seen in Star Wars: The Clone Wars on the planet of Ryloth. Macias has presented her handmade creations to various voice actors and notable figures of the Star Wars television shows including Dave Filoni, the director of Star Wars: The Clone Wars and Star Wars Rebels. "To celebrate the sixth year anniversary of The Clone Wars feature film, I made an Ahsoka inspired tooka doll and gave it to Ashley Eckstein at the Woodbridge Center Mall in New Jersey, where she debuted Her Universe products at F.Y.E. It made me so happy to give something back to her, since she’s always so giving when it comes to the fans," expresses Macias. 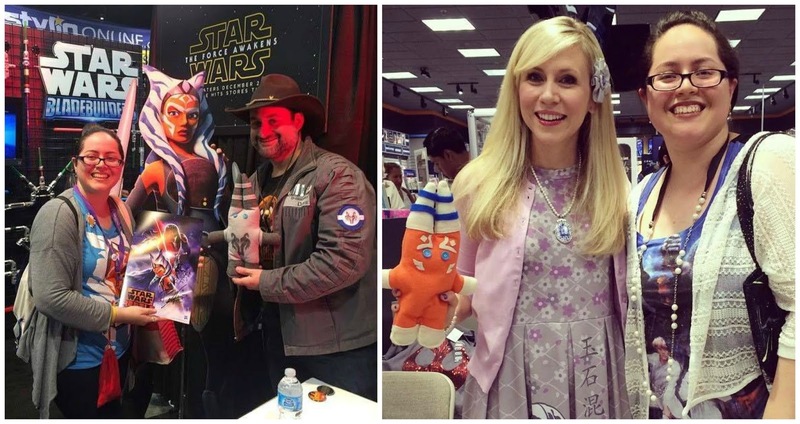 Dave Filoni and Ashley Eckstein with the custom tooka dolls that Johnamarie Macias made by hand. Follow Johnamarie Macias on Twitter and Instagram at @BlueJaigEyes. Galactic Fashion can be found on Instagram at @GalacticFashionTWG. All photos used with permission and courtesy of Johnamarie Macias.